OF FILM-MAKERS working today, Christian Petzold is best placed to create a homage to “Casablanca”. In “Barbara” (2012) and “Phoenix” (2014) the German director considered love under fascism and his country’s complicated history. “Transit”, his latest film, is similar in tone to his previous work but bears clear traces of Michael Curtiz’s classic romantic drama, too. Like “Casablanca”, it is set in a port city where civilians await passage to escape an occupying force. 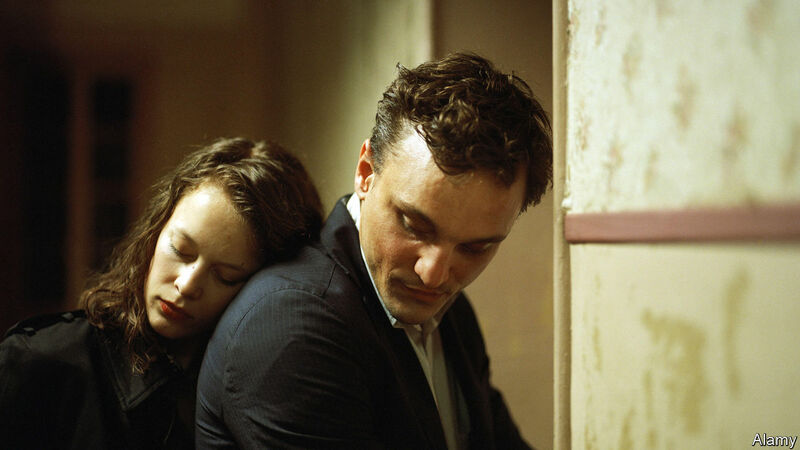 Mr Petzold refers to that celebrated film while still making an original and timely statement. Based on a novel by Anna Seghers published in 1944, “Transit” boldly transfers the plot from Nazi-occupied France to the modern day. It centres upon Georg (Franz Rogowski), a Parisian who has escaped imprisonment. He agrees to deliver two letters to Weidel, a writer in hiding. One is from his wife, begging him to come to Marseilles, where she has arranged a one-way trip to Mexico; the other is from the Mexican consulate, confirming his exit visa. When Georg finds Weidel dead, he visits the consulate, hoping for a finder’s fee for delivering the letters and details of the man’s demise. Instead, he is mistaken for the writer and realises that he has stumbled upon a way out for himself. Matters are complicated when Georg meets Marie (Paula Beer), Weidel’s wife, by coincidence. Though she is waiting patiently for her husband’s return, he quickly falls in love with her and she seems to reciprocate his feelings. The terms of the tragedy are set. Marie will not leave without knowing the whereabouts of her husband, but Georg cannot tell her the truth about his fate—nor inherit the documents, and thus his own freedom—without breaking her heart and risking her staying behind. There is also a third man, a doctor who Marie had previously taken as a lover, lingering in the background. In addition to hiding his identity and avoiding the intensifying activities of the military police, Georg must compete for Marie’s love. Unlike the coiffed and glamorous figures in “Casablanca”, the characters in “Transit” are visibly harrowed by their experiences living under an oppressive regime; there is talk of concentration camps and an impending military operation known ominously as “the spring cleaning”. Their faces are grave and weary: Mr Rogowski has the crooked visage of an aging prizefighter, Ms Beer has a fragile beauty. The lead characters need each other in some way, yet romance or closeness is not a reprieve but a risk in this precarious environment. It is a rich and complex love story crafted by an emerging master. In previous films, Mr Petzold has demonstrated a light touch: his camera barely moved, and he allowed his actors to shoulder the burden of the narrative, rarely accentuating their work with cinematic flourishes such as flashbacks or showy editing. Here he magnifies his characters’ predicament. He heightens the tension through repetition: there are several moments when Georg almost forgets to respond when called by Weidel’s name, and there is no doubt that such a slip could result in his death. Mr Petzold also employs a semi-omniscient narrator whose identity is revealed only later in the film. “Ports are places stories are told,” he says early on, framing the subsequent sacrifices and betrayals as both fiction and truth. The director’s most unusual choice was his ahistorical approach. The exact era in which “Transit” takes place is never specified: the architecture and cars are modern, but there are no mobile phones, and the characters seek passage on a ship, not a plane. But the effect is compelling rather than jarring or heavy-handed. It shows, as “Casablanca” did, that those living under oppressive regimes may grapple with love and loss as well as the question of survival. By collapsing the past and the present in this way, Mr Petzold has made an urgent, riveting film. Previous PostPrevious What would a no-deal Brexit mean for universities and research?